All the stars I see tonight! 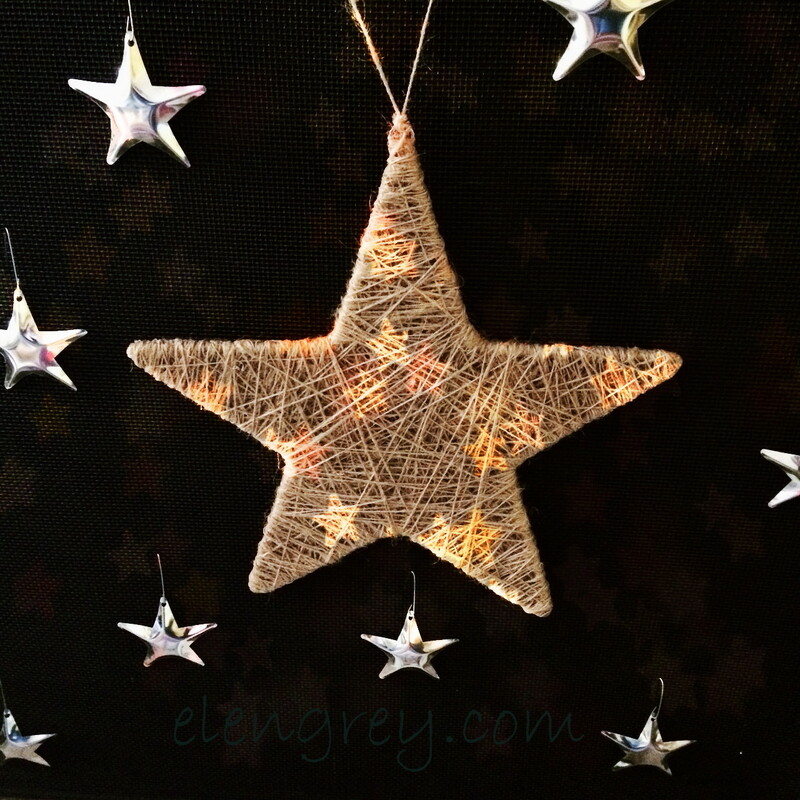 I can’t remember where I picked up the string star, but the shiny, tin stars are from Lee Valley Tools Ltd. We have the tin tinsel, too. Normally, the stars go on the tree, but not this year. I attached them to the fireplace screen for a little extra fireplace bling. This close shot taken yesterday got a little bokeh filter action from #acolorstory . Heh. Listening to Sharon Jones & the Dap-Kings on Spotify singing Please Come Home for Christmas. That’s how we’re rollin’ on the 2nd Friday in December. Here comes Ms. Etta James. And that is my only little tale to tell today, for I have pages of story to write before I sleep meet you in the bar in 3…2…1… If you get there before I do, I’ll have a Grey Goose martini. Just a suggestion. Ha. I was just leaving a comment at your blog. Thank you, Kellie. Hm. You’re the sommelier. My only rec is BIG wine. Friday, light romantic snow, Dave… Just a suggestion. Fireplace bling is awesome! I would totally bling out my fireplace if I had one. Neat star, too! Thanks, Eric! I think I might have gotten that star at the annual Toronto Christmas Market at the Distillery District. What a great place for those stars! I have some too, and the tinsel. Thanks for the tip on A Color Story: downloading it now. Going out for pizza tonight with The Dining Room cast and crew. I see a BIG RED on the evening horizon. Thanks, Bunty. Hope you enjoy A Color Story app. Let me know. Mm. Pizza! Sounds like a fun evening. Oooh, Grey Goose sounds great. Too bad I’m a geezer and cant hold it worth a damn. Where did time go? Where was the Grey Goose when I was a younger man. In college, a buddy and I had the nickname, ‘The Shmirnauf Brothers’. (sp) I have a friend who was owned a tool shop here in Rochester. Tool makers are extremely smart. So are peeps with Grey Goose. Maybe G-man has ulterior motives??? I’m a very lightweight now which has more to do with being a geezer. Speaking of which, this Wednesday will be another ‘geezer’ night, then a story.